Samuella Takyi-Buachie came to Drexel because of the top-notch faculty and the Drexel Co-op program, and she has taken full advantage of her opportunity to gain experience and travel the world. She worked for four different companies and organizations during her 18 months of co-op. She completed her first co-op at SAP and returned to the company for part of her second due to the strong relationship she developed with her manager during her first. For the summer portion of her second co-op, she joined Google as a global customer experience intern with Google Marketing Solutions. For her third, she split her time as a marketing fellow for the Tarkwa Breman Community Alliance in Ghana and a technology consulting intern at PricewaterhouseCoopers in Dallas, Tex. At Google, she worked with Google advertisers, publishers and users to troubleshoot problems and provided advice on how to reach customers’ business goals and increase return on investments through Google AdWords and other Google services. She loved meeting people from all different walks of life and learning about them, and also the free massages. 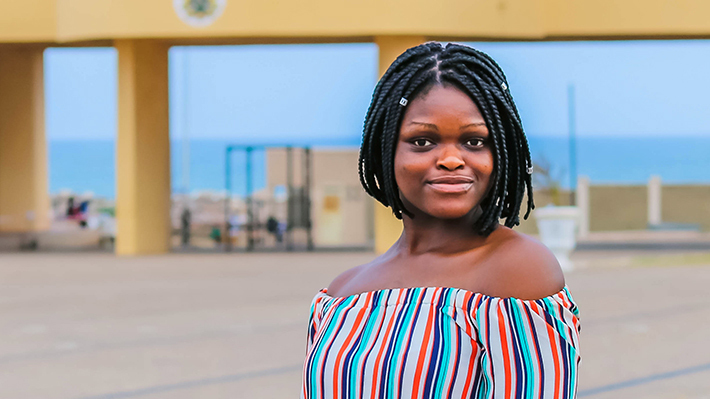 After six months of classes, Takyi-Buachie headed back out on co-op, this time starting her work as a marketing fellow with a non-profit called Tarkwa Breman Community Alliance based in Ghana, West Africa. Her role is to best tell the story of the school through video and social media to improve the organization’s brand awareness and fundraising activities. “Being from a developing country, I realized at an early age that the four main industries I wanted to contribute to were technology, healthcare, education and the financial services,” she said. Customizing her co-op experiences has allowed her to gain skills and knowledge in each of these areas that will help on her job search when she graduates in 2018. Takyi-Buachie was born and raised in Ghana, West Africa, but her family moved to Philadelphia in 2006. After attending high school in the city, she was selected for the Drexel Liberty Scholars program, which provides high-achieving Philadelphia students full five-year scholarships to attend Drexel. In addition to her dual major, she is also pursuing minors in international economics through the School of Economics and international area studies through the College of Arts and Sciences. In her spare time outside of classes and co-op, Takyi-Buachie runs her own blog, Sincerely, Samuella, which focuses on personal development, food and photography, and caters for private events. She is also a member of the Drexel African Students Association, an ambassador for the Drexel Fellowships Office and founder of the Drexel African Dance Team.